We all have that one ugly utility ladder in our house. You might be using it for cleaning the fans, or for taking out those nasty webs on the ceiling. But what do you do after your work is done with the ladder? It is sort of a big, ugly item that takes up a lot of space. What if I tell you there is a way to decorate your outdoor space say a balcony using that same ladder? I recently purchased a three step ladder myself. Living in a rented apartment, it was such a pain to have that stashed in a corner of the room. There had to be a better way of camouflaging it. 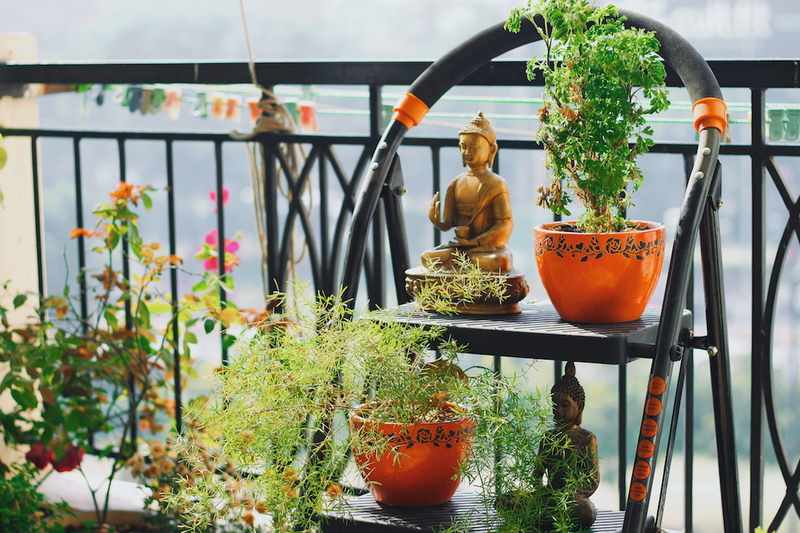 So came the idea of using the ladder for decorating my balcony garden. In my last post, I talked about all the unwanted wedding gifts, and how to make use of them in your home. Taking cue from that, I decided to decorate my small balcony using my ladder. All of these items were already pre-existing in my home. So this project cost me absolutely nothing. The colourful potted plants are easily available in any of the nursery stores. I picked mine from Sector 56 Gurgaon. There is a furniture flea market on the streets. All of these pots are priced between INR 50-75 a piece. If you’re not much of a garden or plants person, I would recommend stick to a lot of greens rather than seasonal plants. So for example, money plants, cactus, allow vera, ferns look great. They are easy maintenance, and with time, they look even prettier when the leaves span out. For this DIY, I used three meditating Buddhas. All three of them were wedding and house warming gifts. I had used them in my indoor decor for quite a while. So this was a nice change to use them to decorate my outdoor space. If you don’t want to use Buddhas, then go ahead with any clay or ceramic figurines. Small, big size any of them can be used just to add a pop of colour to the decor piece. My favourite part about this outdoor decor space are these gold rimmed floor lanterns. I picked the pair for INR 500 in total from Sector 56 Gurgaon. Also the candles you see inside them are LED battery operated ones which are approx 600 bucks for three. You can get these easily on Amazon, or any of the home stores like homecentre. A ladder can take up a significant space. In my case, I put it up in one corner of my balcony. I also used additional small pots & plants to cover up the lost space in between the four legs of the ladder. You need to see what alignment works and doesn’t work. Say for instance, the picture on the right pretty much covers the middle level Buddha. Play around to see what colours (pots, plants vs figurines) go well with each other. I purposely kept winter plants out of this decor as they are seasonal. I wanted something more permanent that would last me in the summers as well. So you can see snake plant, ferns and other all season plantation in this decor. By using a ladder for decorating your balcony, not only do you get ‘rid’ of it. You also get a way of adding height to your small outdoor space. I tend to collect a lot of these ceramic pots. Once, I am back at home, I realise I don’t have the space to display it all. This ladder has to some extent helped me organise my outdoor balcony clutter. These pictures are all taken in broad daylight. But in the evenings, what I tend to do is add battery operated LED candles in front of all the Buddhas. It just lights up the entire corner and looks pretty serene. If you do try out this decor hack of decorating balcony using a utility ladder, do share the pictures with me. I would love to get a look at your creation.